Hot water is something we all take for granted until it’s not there. If you live in Brisbane and are having problems with your hot water system, don’t suffer any longer than you have to. We’ll send one of our experienced plumbers to your home or business at a time that fits in with you. We’re on call 24 hours a day, 7 days a week for all your hot water emergencies, and we’ll soon have you enjoying hot water again. Hot water is something we all take for granted until it’s not there and for most of us, there’s nothing worse than stepping into a cold shower on a chilly morning. If you live in Brisbane and are having problems with your hot water system then we’re here to help. Brisbane Plumbing and Drainage is one of Brisbane’s leading hot water plumbers and electricians. Our hot water plumbers are never far away and are driving vehicles fully stocked with replacement parts and components, to fix your particular hot water issue TODAY. We’ve been installing and repairing electric, gas, and heat pump water heaters in Brisbane homes for many years and have built our reputation based on reliability, good workmanship, and fair prices. Thanks to our 24-hour emergency hot water service and hardworking team of local plumbers, we’ll have your hot water system back up and running in next to no time. You shouldn’t have to be without hot water so give us a call right away on (07) 3483 0482 and we’ll send one of our trusted plumbers direct to your door. Need a Hot Water System Service in Brisbane? If your hot water system isn’t running efficiently, then not only will it be costing you money, but it may be harming the environment too. 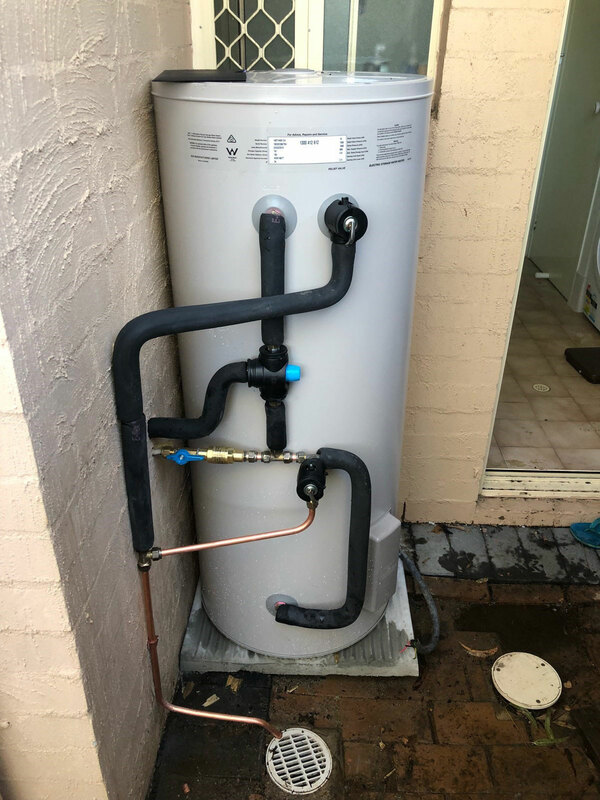 Our licensed Brisbane plumbers and gas fitters have the experience and knowledge to quickly identify and solve most problems and can handle repairs for all brands and models of water heaters. Since our fully stocked vans carry a large range of parts, most problems can be fixed the same day. This allows us to deliver a speedy and efficient service that is second to none. In the event that you need a new hot water tank then we can help you with a wide range of the best selling systems from top name brands, efficiently installed, and often on the same day too. We carry a wide range of replacement hot water heaters in all shapes and sizes and are authorised service technicians for all the best brands including Dux, Rheem, Vulcan, Thermann, Aquamax, and Rinnai. We’ll be able to advise you on the best make and model to suit your particular hot water usage and should you be upgrading from electricity to gas, we can even fit you with a temporary system during the conversion, so that you’re not left without hot water – it’s all part of our service! As well as servicing most makes and models of electric, gas, and instantaneous hot water systems, we also carry out annual maintenance checks which include visually checking for signs of wear & rust and replacing pressure and temperature relief valves. Regular hot water maintenance will help avoid any unnecessary breakdowns and save you money in the long run by increasing your hot water system’s efficiency. Hot water heaters are expensive appliances so it’s important to weigh up your options carefully. With so many choices it’s easy to be swayed by the lowest price and lose focus on what really matters – quality, reliability, efficiency. We go to great lengths to ensure that all new hot water systems we install ticks all of these boxes so that our customers can enjoy trouble free hot water for many years to come. We’re experienced in all matters concerning hot water installation and will give you unbiased good advice. Have a Hot Water System but no hot water? We can discuss all of the water heating options to suit your home or office, budget, and lifestyle and help you make the right choice. With energy costs continually rising, we can also offer payment options to help keep costs to a minimum including interest-free finance. Get in touch with us to install or repair your Hot Water System today! At Brisbane Plumbing and Drainage we’re fully licensed and qualified to carry out the necessary plumbing and electrical work required for hot water installation and repairs, eliminating the need and cost of employing another tradesperson and holding up your installation. Our contractors will take care of everything from start to finish expertly installing a new hot water heater to ensure you get the best out of your hot water system. Call our friendly team today on 1300 740 206 to request a no-obligation quote or estimate.